A lovely chest of drawers made of solid oak. This traditionally designed chest of drawers is produced using traditional methods and is hand finished. Standing on outswept bracket feet, the chest houses two smaller drawers to top, and three graduated drawers below providing plenty of storage space. Flanked by decoratively reeded columns, all the drawers are lined with solid oak, emphasising the quality that this piece carries. 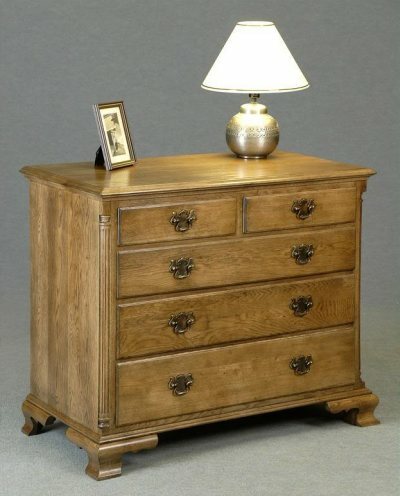 A beautiful solid oak chest of drawers which would grace any bedroom; period or contemporary. Matching pieces in this range are available; please see the bottom of the page for further details. Please do not hesitate to contact one of our friendly members of staff on 01543 375872, who will only be too happy to answer any further questions you may have.